Melissa Samoskevich is a forward from Sandy Hook, Connecticut, playing for Quinnipiac University. Before Quinnipiac, Samoskevich played for Shattuck-St. Mary’s where she served as a captain. During her time at Shattuck-St. Mary’s, Samoskevich recorded 56 goals and 38 assists for a total of 94 points in just 50 games, good for a very impressive 1.88 points per game. Her performance at Shattuck earned her both All-USA Girls Hockey Player of the Year and YouthOne Player of the Year. At the international level, Samsokevich played two years with the United States Women’s U-18 Team. During the 2015 U-18 Women’s World Championships, Samoskevich scored a tournament-high six goals and added two assists for eight points in five games as she helped lead the U.S. team to a gold medal. At the end of the tournament, she was named the top U.S. Player for the tournament and was also named to the Media All-Star Team. 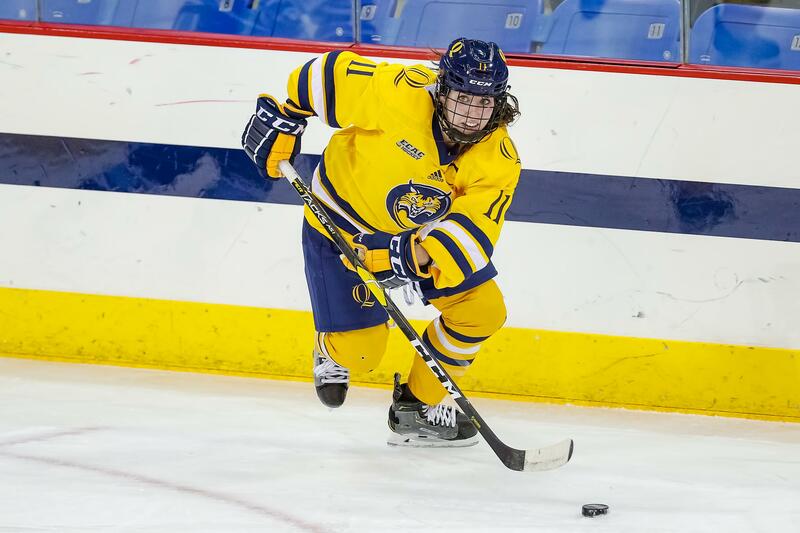 Samoskevich burst onto the college hockey scene as a freshman at Quinnipiac. Her 16 goals and 16 assists added up to a point total of 32. Half of her goals (8 goals) were game-winning goals, which ranked second in the country. Additionally, her 32 points were fourth-most in the country by a rookie and her 16 goals were fifth-most in the country by a rookie. In terms of the Quinnipiac program, Samoskevich’s point total was the third-most recorded in a season in program history. At the end of the year, she was named the ECAC Hockey All-Rookie Team and was named the Quinnipiac Rookie of the Year for her efforts during the season. As a sophomore, Samoskevich recorded a slightly lower but still notable point total. She had a team-high 19 assists and 29 points. However, her goal total dipped from 16 goals her freshman year to 10 points as a sophomore. Samoskevich was also second on the team in plus-minus rating with a plus-19 rating and was invited to the U.S. Women’s National Team Camp. Last year, Samoskevich tallied 25 points, as she led Quinnipiac’s team in point totals yet again. She scored 15 points and added 10 assists. Her ten assists ranked third on her team. This year, Samoskevich has 15 points in 24 games. She is serving as the captain of a Quinnipiac squad that is fighting to stay in the middle of the pack of the ECAC standings. This past December, Samoskevich was drafted second overall by the Connecticut Whale in the NWHL draft. Keller helped lead Boston College to two identical 4-2 wins over Providence this past weekend. During Friday’s game, Keller recorded one goal, two assists, and a team leading plus-three rating. Keller picked up the primary assist on the opening goal of the game just over a minute in and scored the game-winning goal midway through the game. On Saturday, Keller continued to produce with two assists and another plus-three rating. She assisted on BC’s first two goals to help the Eagles to a 2-0 lead. Overall, Keller had five points and four shots on net in just two games. Gabel contributed to all but one of Clarkson’s eight goals this weekend as she recorded seven points in two ECAC matchups. In Friday’s 4-2 win over Harvard, Gabel factored in on all of Clarkson’s goals with two goals and two assists. She opened up the scoring early in the first period and added the game-winning goal later in the game. Additionally, one of her assists came on the power play. Gabel added another three points in a 4-2 win against Dartmouth on Saturday. She scored the game-winning goal yet again and added two assists on the power play. Selander allowed just one goal in two games as she faced 90 shots this weekend. In a 1-1 tie against Yale on Friday, Selander made 48 saves and allowed one goal. The one goal came late in the game. After allowing that goal, Selander would shut the door for the rest of the weekend. Selander then recorded a shutout against Brown as she made 41 saves. Overall, Selander finished the weekend with a 0.50 goals against average and an incredible 0.989 save percentage as RPI was outshot, 90-36, across their two games. Loren Gabel of Clarkson was named the ECAC Player of the Week for her seven-point weekend that included her 100th career goal. Gabel leads the NCAA in scoring with 49 points in 24 games. In December, she was drafted eight overall by the Buffalo Beauts in the NWHL draft. Jessie Eldridge became the Colgate Women’s Hockey all-time leader in scoring on Saturday when she scored a goal against Cornell. The goal was Eldridge’s 20th of the season. Eldridge was selected by the Buffalo Beauts 13th overall in the NWHL draft. Lovisa Selander of Rensselear was named the ECAC Goalie of the Week as she stopped 89 of the 90 shots she faced over the weekend. Selander has a 1.86 goals against average and 0.948 save percentage for the season and was drafted by the Boston Pride 20th overall in December’s NWHL draft. Megan Keller of Boston College was named the Hockey East Player of the Week as she recorded five points in two games. Her 32 points for the season leads all defenders in the nation and is tied for 10th among all skaters. The Buffalo Beauts selected Keller third overall in the 2018 NWHL draft. Katelyn Rae became the first player in Merrimack College Women’s Hockey history to record 100 career points as she recorded in assist in a game against Boston University on Friday. Rae was drafted 12th overall by the Connecticut Whale in December. Last week’s must-see matchup between RIT and Robert Morris featured two wins by Robert Morris by a two-goal margin. 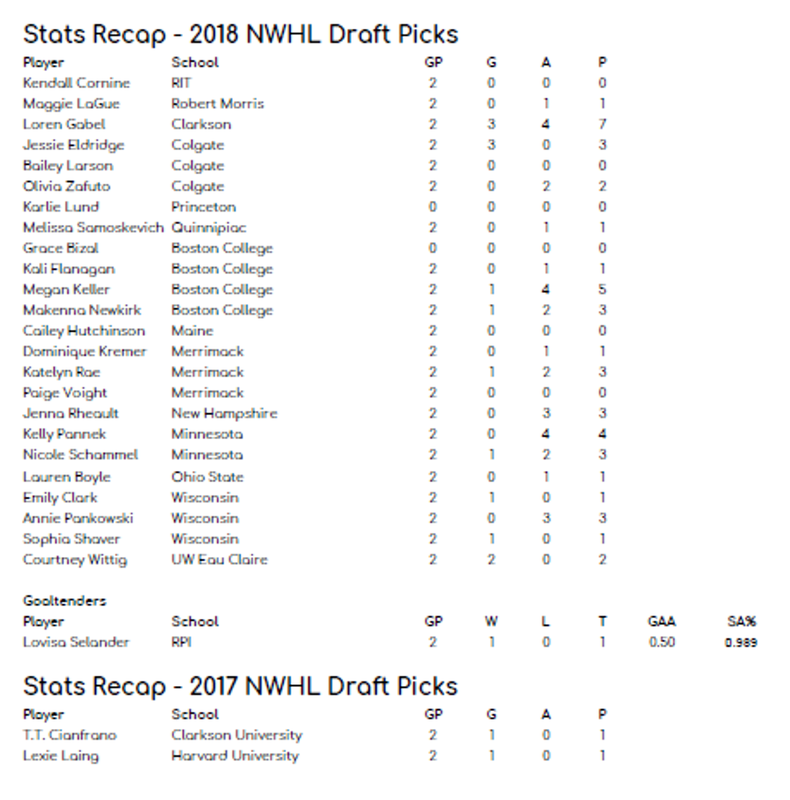 In Friday’s 3-1 Robert Morris win, Kendall Cornine and Maggie LaGue, the two NWHL draft picks in the game, stayed quiet. RIT opened the scoring less than three minutes into the game. However, Robert Morris scored three unanswered goals in the second and third periods to win the game. All in all, Robert Morris outshot RIT 42-16 and RIT only mustered 6 shots in the second and third periods combined. On Saturday, Robert Morris shut out RIT 2-0 and outshot the Tigers 35-14. Maggie LaGue, a Connecticut Whale draft pick, assisted on Robert Morris’ first goal of the game, which came on the power play. Robert Morris later scored on an empty net towards the end of the third period. Kendall Cornine of RIT, a Metropolitan Riveters draft pick, stayed off the scoresheet over the weekend, but had five shots on net between the two games. For this week’s must-see matchup, we will look at an ECAC game between Clarkson and Princeton. After having had the past two weekends off, Princeton is in for a busy week with three games. One of those games includes ECAC opponent Clarkson. Karlie Lund of Princeton, a Minnesota Whitecaps draft pick and Loren Gabel of Clarkson, a Buffalo Beauts draft pick will face off in a crucial matchup between two teams at the top of the ECAC standings.